LOS ANGELES (AP) — However riotous the Eddie Murphy stories from Arsenio Hall, Tracy Morgan, Adam Sandler and Russell Brand, the highlight of Spike TV’s tribute to Eddie Murphy was the comedian’s duet with Stevie Wonder. Murphy joined the subject of one of his most classic impressions for a rousing rendition of Wonder’s 1973 hit “Higher Ground” during the taping of the Spike TV special “Eddie Murphy: One Night Only,” which is set to air Nov. 14. The Roots served as the house band. 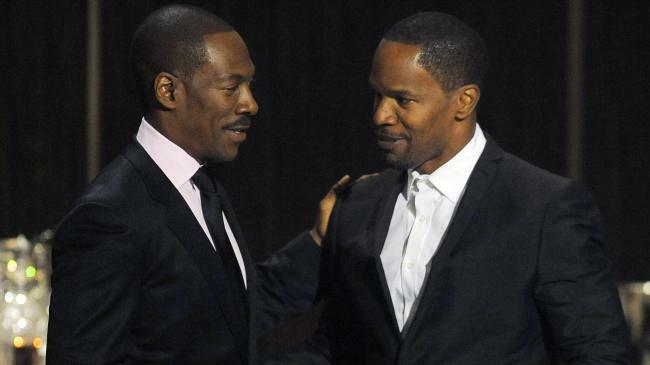 Jamie Foxx, Tyler Perry, Martin Lawrence, Chris Rock and Keenan Ivory Wayans were also among those paying tribute to Murphy Saturday at the Saban Theater. Accompanied by a pretty blonde, Murphy beamed throughout the two-hour program Saturday, saying he was touched by the tribute. “If it weren’t for Eddie, we might not have all the wonderful films that I’ve made,” Jackson said. Murphy insisted before the tribute that he is retired. The 51-year-old entertainer took the stage at the conclusion of the tribute to say that he was moved by the honor.